Serves 6. Preparation time 10 minutes. Cooking time 15-20 minutes. Fish doesn't have to be expensive to taste great. Baking hake in foil over the coals ensures it staysjuicy. • Combine the marinade ingredients and use a pestle and mortar - or a food processor - to grind them. Wash the fish and pat dry with kitchen paper. Grease a large piece of foil with butter and place the fish on the foil. Baste it on the inside and outside with the Thai curry paste and put a stick of lemon grass in the abdominal cavity. Spoon 1/3 of the marinade over the fish and wrap it in 2 layers of foil. 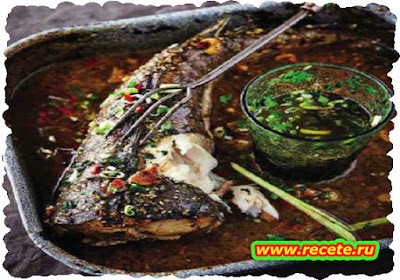 Allow the fish to marinate in the fridge for an hour. • Braai on a grid over medium-hot coals for about 10 minutes a side. To test if the fish is cooked, use a metal skewer or a small knife and prick the thickest part. Keep the skewer in for 5 seconds. The tip will be hot to the touch if the fish is cooked. Remember that the fish will continue to cook for at least 5 minutes after you've removed it from the fire. • Put the fish in a dish and remove the foil and the skin. Pour the rest of the marinade over and sprinkle with the sesame seeds and sesame oil. Serve with rice to soak up the sauce.